Blue jays are smart, omnivorous birds that adapt well to a variety of environments, although they typically are forest dwellers. They not only employ a characteristic “Jay! Jay!” call, but also mimic other bird calls like hawks. Blue jays are easily seen across North America from forests to suburban backyards. 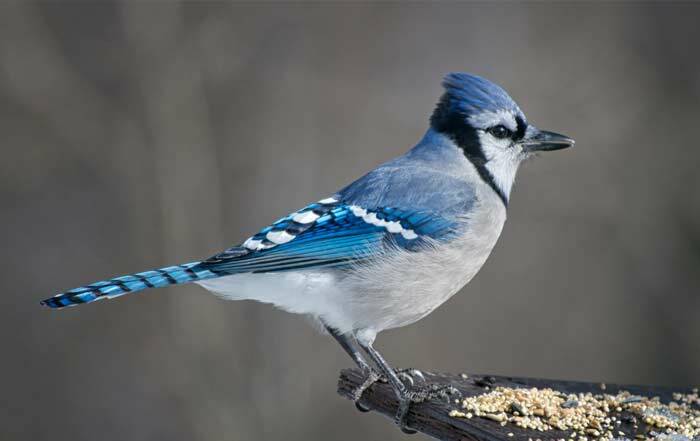 Blue Jays are known for their distinguished blue and white appearance. They measure around 10 to 12 inches full grown and have a wingspan of 13 to 17 inches. They typically weigh between 2.5 and 3.5 ounces. Although they are known to be omnivorous (due to the fact that they can eat eggs and nestlings of other birds), they more commonly feed on acorns, nuts and seeds.